For anyone following the general disruption happening of the electronic payments space, or the Apple Pay / MCX war in particular, this exchange is an interesting data point. There are two takeaways I see from this. The first is that "it's on". The siege by new players / models on the electronic payments ecosystem is starting to impact the conversation, if not the bottom line (yet). Apple Pay and other technologies are beginning to pierce the fees framework that has long filled the coffers of the existing electronic payments system. Today the more successful emergents operate as a friend to the existing players (but that will change). The second takeaway is that the existing players do not yet fully grasp the siege underway. The war is not Apple vs. MCX; it's Apple + MCX vs the status quo. In this discussion, Apple Pay is being blocked by retailers because it is "too friendly" to the existing system, perpetuating the existing fee structure rather than attacking it. MCX and it's parter retailers understand that the existing fees structure is outright robbery given today's technology, and they are taking a stand. The Apple Pay / MCX battle is one between two armies on the same side, each with different strategies and assets. Apple doesn't win by taking a portion of the existing fee structure, and neither does MCX. They and the other disruptors win by decimating the economics of the current system. Apple is building an army of users before striking. MCX already enjoys its army of retailers and sees Apple as a threat to this asset. Battles will be lost, but the war will be won. This salvo may not strike the death blow, but more attempts are coming. The existing electronic payments system is bloated with technology that has been displaced with significantly cheaper, more secure options. Significant value that the current system enjoys will be returned to the consumer (through lower prices), retailers will retain some as will new players within the system (e.g. Apple). The days of merchants paying 2 - 4% per transaction are numbered. We have seen how the internet of information has transformed the world over the last two decades. More recently, the internet of things has emerged as a new frontier of innovation. Following close behind that is what some call the internet of value. Like its siblings, the internet of value is decentralized, open, and a blue ocean for innovation. There were never more than 1.2 billion landlines. Then the cellphone came and we’re at 6.3 billion. Why? It’s not because only those people wanted to communicate. The landlines were all post­pay. You need to have credit to get one. The cell phones were pre­paid. Suddenly you could get one with cash. It had nothing to do with technology. It was an economic restriction. Now there are 1.5 billion bank accounts, same threshold as land lines. I think [an internet of value] will allow us to see 6.3 billion people banking on their cell phones. That’s what’s so exciting to me. That’s a much better world than we have today. Many like Cesares believe an internet of value will lead to a similar improvement in enabling access to more commerce. The primary technology that will lead to an internet of value is blockchain. For the purpose of this blog post, we use blockchain to refer to any transaction processing engine with no central authority required that allows for contracts and transactions between parties. “It’s a technology that allows data to be stored in a variety of different places while tracking the relationship between different parties to that data." (source) Blockchain is considered the biggest disrupting force in financial services, according to Oliver Bussmann, CIO of UBS.4 Bitcoin is the most widely known example. Another of note is Ripple. As noted in the definition, the opportunity of blockchain is not limited to currency­based transactions. The technology can be applied to any transaction or contract where security and trust between participants is needed. There are two areas of near-­term interest as we work to understand the blockchain impact; blockchain as it relates to digital currency (i.e. Bitcoin), and blockchain as an infrastructure (i.e. Ripple). Most focus on blockchain’s impact on fiat currencies, given the emergence of Bitcoin, and the companies and infrastructure that are required to deliver on such a vision. 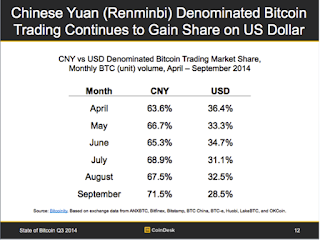 Bitcoin is the most prominent blockchain­-based currency in circulation. Others, often referred to collectively as “altcoins”, have not yet developed significant markets as compared to Bitcoin, taking only 8% of all value stored among blockchain-­based currencies. Wallets store Bitcoins for future transactions. Payment processors manage the transactions themselves. Exchanges bring together the parties of the transaction ­ the buyers and the sellers. 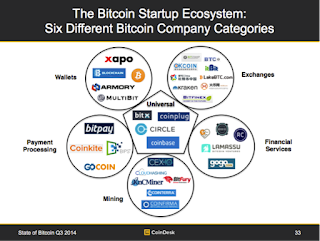 Financial service providers are building services on top of the Bitcoin ecosystem. And Miners operate the underlying technology that maintains the trust within the system. 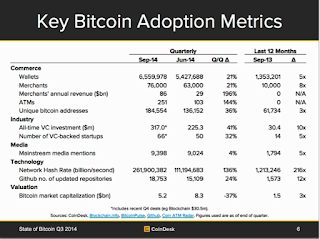 As the Bitcoin ecosystem grows and matures, the opportunity evolves beyond its role as a currency. Beyond its role as a currency is what else can and will be done with the system. A concept is known as pegged sidechains, “which enables bitcoins and other ledger assets to be transferred between multiple blockchains (source)” is expected to enable non­currency transactions with the same flexibility and security as the current currency transactions enjoy. Some of the altcoins launched have been developed for other transactions beyond just currency. However, none have managed to develop enough of a market to have impact. Enabling this sort of technology within Bitcoin itself eliminates much of the current impediments to innovation in this area. The currency side of Blockchain is interesting and potentially transformative, but it is still very immature. The more relevant area, however, is blockchain’s potential at revolutionizing any transaction infrastructure, significantly reducing costs and improving system security. Bitcoin and most altcoins are trying to revolutionize the current system, purposely intending to supplant the existing players. A nascent few, however, are working within the system to deliver the economic benefits without the intent of displacing their existence. Ripple is an example of how blockchain can improve on existing banking infrastructure. First focusing on international money transfers, the Ripple protocol allows banks to transfer value anywhere in the world for the minimal cost of implementing its technology. Transfers themselves are near free, and are transacted in the home currency of both the sending and receiving bank. Exchange rates are made part of the same transaction in real­time, reducing exchange rate risk. The Ripple protocol is open sourced ­ there are no license or usage fees associated with its implementation. Ripple makes its money off the underlying currency that supports the protocol. As more banks employ the protocol to transact, the value of the underlying currency increases. So far Ripple is the only startup we have seen that is working within the existing system to implement blockchain technology. They already have representation within China. However, significant opportunity exists to support their efforts, should their intent prove valuable to the banking community.